I was born in 1971 and live in Kaarina, Finland. According to my parents I have been interested in dogs ever since I was 3 years old. In the early years I had to settle with taking care of our neighbors' dogs. At the age of 13 I finally got my first own dog, Cavalier King Charles Spaniel Pepsi (1984-1992). Pepsi could do a lot of tricks and was easy to live with due to some basic home obedience training. At that time I knew nothing about dog sports. I used to spend time at a parking lot near our house with a girl from next door. We were running some obstacle courses with our dogs. We planned the paths for ourselves and the dogs. Sometimes we wanted the dog to run under a fence and sometimes they had to jump over them or balance on them etc. When I saw "real" agility for the first time in 1992 I could not believe an actual sport with obstacles that are designed for it really existed. I fell in love with the sport immediately and that love has not diminished during these 20 years. My second dog was Border Collie Visse (1992-2006) who became the first Finnish triple Champion in the breed: Visse was an Agility-, Obedience- and an International Show Champion. Visse and I were competing or passing tests in ten different dog sports: agility, obedience, tracking, search, messenger dog trial, search & rescue, flyball, breed shows, water rescue and herding. This variety of sports inspired me to come up with my kennel prefix Decathlete's. So far there are 7 Decathlete's litters. 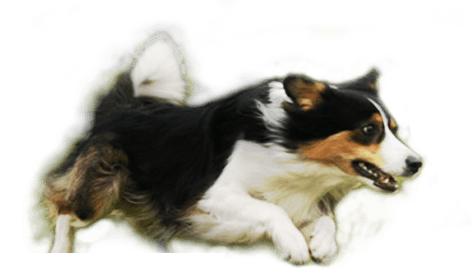 The dogs of our breeding have more than 50 titles from different dog sports. My third dog was Tekla (born in August 1997) who is my own breeding. Tekla became the first Finnish Border Collie receiving champion titles in four different sports: Tekla is an Agility-, Obedience-, Working Trial- and a Show Champion. Tekla became deaf at the age of 6 years. I had to start agility all over again. If Tekla did not become deaf I would never have learned half of the things I know today: what a dog sees and thinks and how it reacts to different things in agility. Tekla has been my agility instructor. Tekla has been my once-in-a-lifetime-dog and I think I will never get another dog as balanced as she is. My fourth dog was Border Collie Cosmo (born in September 1999) who was my first male dog. Cosmo became a Finnish, Swedish and International Agility Champion and also a Finnish and Swedish Obedience Champion. Cosmo and I were representing Finland in the national agility team for three years. Our best placement in the World Championships was 9th. My fifth dog was a Border Collie male called Hugo (born in January 2004). Hugo received a champion title in both agility and obedience. At the age of 2 years he was placed 5th in the Finnish Agility Championships. Unfortunately Hugo hurt his wrist at a very young age and could not go on with agility anymore. Hugo is now an obedience dog handled by Sini Honko. My sixth dog was again of my own breeding, Border Collie Hitti (born in January 2007). Hitti is a Finnish, Swedish, Norwegian and International Agility Champion, Finnish and Swedish Jumping Champion and Finnish Obedience Champion. 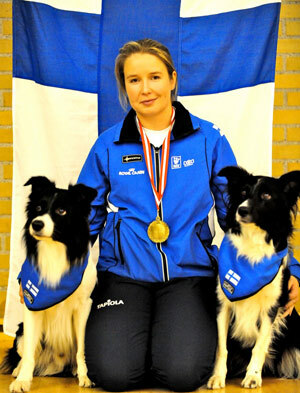 Hitti has won the Nordic Championship in agility three years in a row (2009-2011). During the last two years Hitti has run about 70 clean runs in the highest class per year. I could not dream of a better agility partner than Hitti is, she is a godsend. My youngest dog is Border Collie Fu (born in February 2011), imported from Czech Republic. Fu training agility for 10th time in her life as 8 months old. In 2010 I was competing for six months with my breeding, Border Collie Omie, when his owner Elina Jänesniemi injured her leg. Omie and I won the Finnish team tryout competition and were placed 8th in the Agility World Championships in Germany. That year I had a double win in the Nordic Championships when Hitti won and Omie was second. I handled Omie also in the European Open team competition when our team won the championship. In addition to the different champion titles my dogs have been placed in several Finnish Championship competitions and been leading and winning Ranking lists. It has been an honor to be able to work with all these amazing dogs! When people see me running in agility course, I want them to see in every run that I'll do it from my heart. I just love agility and my dogs and I hope it can be seen also for audience! My highlights as a breeder have been the Finnish Championship medals, qualifications to national teams and having a team consisting of Decathlete's dogs win at European Open in 2010 and 2011. It has been unbelievably great to watch the dogs of my own breeding succeed year after year with their fantastic handlers! The team of 2011 consisted of Jaakko & Zen and three of Zen's offspring; Janita & Hitti, Mikko & Sky and Heidi-Maria & Erre. I have been a professional dog trainer since 2000 when I qualified as a dog therapist. Before that I had been an active member in different dog associations. I have done a lot of different work with dogs along the way. Currently I am only concentrating on being an agility trainer. My partner (Jaakko Suoknuuti) and I have been travelling abroad a lot teaching our ONEMIND -handling method. When the new Purina Center was completed we decided to stop travelling at least for a year or two. Sadly we have had to refuse a lot of seminar requests to abroad for year 2012 :( Hopefully in near future we are again blessed to be able to travel and keep seminars and meet our agility frieds all over the world. I have dreamt of a warm agility center for so many years and finally the dream came true in November 2011, so now we are enjoying ourselves by training in super circumstances! been involved in different kind of coaching projects such as "Tehotiimi" and "NextLevel"
been a judge on a TV-program called "Hurtta ja Stara"
In addition to my love for agility, training puppies is also close to my heart. I love to train young dogs and prepare them for the challenges of agility and everyday life. Puppies are like open books: you can write the text yourself and shape their behavior to the direction you want. It is very rewarding to see the puppies learn things so fast. In agility I love coaching handlers who are just beginning with the sport. It's such a great feeling to have someone "see the light" and understand what it's all about. Every training session is about learning something new. I get to see the joy of learning every day, can anyone have a better job than I do? The most important thing for me in dog training is being fair to the dog. You should never ask the dog for things you have not taught him. The reason for the dog not knowing something can always be seen in the mirror. Our dogs have strict rules but with the trust they also get a lot of freedom. None of my dogs have ever fought with another dog or bitten a human. Love and limits – that is my motto for a happy life with a dog!